CARACAS - Venezuela’s government-run oil giant — the country’s largest source of cash — is warning that it could default on its bonds as early as next week. 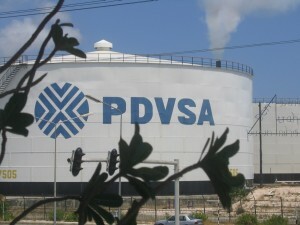 “If the exchange offers are not successful, it could be difficult for the company to make scheduled payments on its existing debt,” PDVSA said in a statement Monday night. It’s unclear if PDVSA may actually default or if it’s trying to strong arm investors to take the deal. “I don’t think they’ve prepared themselves for a default, I think it’s mostly just a threat. The concern is that they’re starting to talk about it,” says Siobhan Morden, head of Latin America fixed income strategy at Nomura Holdings. In total, Venezuela is asking investors to “swap” $5.3 billion of bonds due in 2017 with bonds due in 2020, essentially allowing the government to push back payments. But PDVSA hasn’t been able to lure enough investors to accept the offering. It’s led Standard & Poor’s to cut its rating on PDVSA in mid-September to two notches above default. PDVSA represents much more than just an oil company. It is Venezuela’s lifeline. Oil shipments make up over 95% of the country’s export revenue — that’s cash the government badly needs to pay for imports of food and medicine, which are in short supply. Things have been so badly mismanaged that Venezuela’s oil production hit a 13-year low over the summer after oil services provider such as Schlumberger (SLB) dramatically reduced operations earlier this year due to unpaid bills. Despite sitting on the world’s largest oil reserves, Venezuela is running out of food, medicine and cash as its citizens go hungry. Things could get much worse if PDVSA defaults on its debt. Its economy is projected to contract 10% this year while inflation could soar 475%, according to the IMF’s latest estimates. China, the largest creditor for Venezuela, has stopped loaning more cash to the South American government. Against that dire backdrop, the country’s opposition-led Congress is trying to gain enough support for a presidential referendum vote to knock President Nicolas Maduro out of office. Over a million people protested in Caracas, the capital, one day last month. However, Maduro is fighting all efforts and chances of the vote happening are dim. Maduro’s government is low on cash, and some experts worry that even if PDVSA makes its upcoming debt payments, it will really squeeze the government’s dwindling reserves. Venezuela’s central bank has just under $12 billion in reserves, most of which is held in gold. For now, there’s no light at the end of the tunnel for Venezuela, which needs to sell oil to survive. It’s prized possession is now at risk. “There’s already been an extreme collapse in the economy, and it would probably worsen if there’s an interruption in oil exports,” says Morden.